Amazing book of short stories! This is a book of four short stories that build on each other and yet they seem to have nothing in common until the last story. 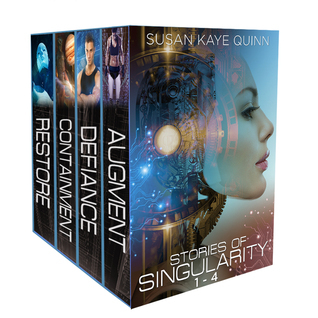 Each story can stand alone but when put together they give you a good insight into Susan Kaye Quinn's Singularity world. At first, because I have not yet read the two novels that Quinn wrote which goe with these stories, I was just a tad disappointed and confused. But as I read each story, they started to make sense to me. By the last story, my favorite, I was in love with this world. Each story gives a different view point of robots and AI. The really scary and creepy part for me is that I don't think we are really that far from all these things happening. We as human beings, if we want to continue to be top dog in this world, need to understand this and figure out how we are going to stay on top. That is one thing that Quinn consistently does with her stories is push the envelope when it comes to robots and AI. She also makes you think long after you have finished the stories. I can't wait to read the two novels, The Legacy Human and The Duality Bridge. While you will still enjoy Stories of Singularity #1-4 without reading the two novels. It might enhance the short stories for you. Either way I loved Stories of Singularity #1-4 and highly recommend it for anyone who likes Sci-Fi or just likes stories that challenge your mind. Take a chance. You won't be disappointed. I was given this book in exchange for an honest review. I loved reading these short stories! Each one was engaging and thought provoking, challenging the reader to see the truth of all the good and all the bad that can exist in a post singularity world.I enjoyed that al of the stories took place in different setting within this futuristic world, and each protagonist differed from the others and had their own unique journeys of discovery to experience. What always works well in Susan's books is the way that you find yourself walking along with the characters, sharing their experiences and allowing them to broaden your view of the world as a whole.I also enjoyed that the stories made you think about themes that are greater than the individual stories and wonder what if? Is this new world really "better" in all the ways that it could be?The only thing that I wish was different- and it's not really a complaint, just my own failure to accept that these are short stories- is that I could have seen more of what's to come.I would recommend this book to all types of readers, young, old, sci-fi lovers, fantasy readers...etc. You will not regret reading about these characters, and if you follow Susan's Legacy Human series, these stories make that tale all the more fun! These stories are amazing companions to the Singularity series. The stories are each from a differnt view point, some of which we haven't seen before. The first story is about a med bot who loves his sick master more than should be possible. The second story (my favorite) is about a maintanence bot on a distant moon that discovers art and creativity. The third is the story of how Eli and Cyrus find out about Eli's mother's sickness and how they take the first steps down a slippery slope. The fourth book is about a mechanically altered human who will give anything to help humanity. These are all unique stories that will add to you understanding of the Singularity "universe" while helping you see a different side to some of the characters that you thought you already knew. As usual, Susan Kaye Quinn gives the reader something to think about. We could be closer than we think to this universe. What decisions would you make? Who would you trust? A shining tribute to the human, and not so human, spirit!Susan Kaye Quinn unveils a cast of compelling characters who bring the masterfully crafted world of Singularity to new life. The wondrous perspectives featured in Restore and Containment will forever alter how you view artificial intelligence, from the heartwarming med bot whose happiness lies in the healing, to the master mining bot whose curious fixation on a cairn, or "Mystery of the Rocks", sparks a creative evolution. The raw journeys of two legacy humans in Defiance and Augment reinforce the resilience of the human spirit, from a clever youth who defies the boundaries that bind him to save the ones he loves, to an augmented young girl with a penchant for battle who's willing to risk everything, even her life, to forge a new path for humanity. These stories were all amazing, each in their own way. Though they all take place in the same Singularity world, they each have a very different feel to them. While they can, theoretically, be read on their own, I highly recommend reading them in tandem with the Singularity novels, as it adds further depth to the novellas.Restore left me feeling sadness and pity. Containment had me brimming with hope and victory. Defiance took me back to the beginning and showed me another pespective. And then, my personal favorite, Augment. This one made me feel... powerful.I can't wait for more! :DA copy of this book was provided by the author in exchange for an honest review. Great set of short stories set in the Singularity world.